The original Geyser Community Hall was built by Finnish community members as a place to have dances and community gatherings. It was a small building located in town. Later, the group purchased an old three story hotel that was in bad repair. They removed the bottom two floors, and lowered the top floor onto a foundation, creating the Geyser Community Hall that we see today. The hall was given to the county during the depression. It was overseen by a small group of officers and again, fell into disrepair. Sometime during the 70’s a group of community members decided to use the hall as a place to have New Year’s Eve Dances, and performed updates on the building, including paneling and wallpaper. The building served the community for many years, until a major hail storm damaged the roof, and caused significant water damage inside. The roof was repaired, the walls and lighting were updated, the floor was refinished, and new windows were installed. 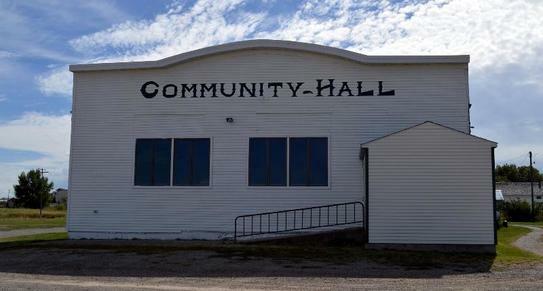 The Geyser Community Hall stands as one of the largest and most beautiful halls in Central Montana. Recently, new tin was purchased for the sides of the building, to replace the old damaged tin. It was then discovered that there is a major problem with the Hall’s foundation that needs to be repaired before this tin can be installed. Estimates for the repair stand at $30-35,000. It is our goal to raise the money for these repairs by selling commemorative tiles that will be installed inside on the North wall. Please help us to preserve this grand old building! It serves as a gathering place for Weddings, Dances, Funerals, Receptions, Senior Citizen events, BBQ’s, Reunions, Fundraisers, and Parties.